Our Congregation was organized in 1973 and has been concerned with providing opportunities for service. Special areas of service include the Stephen Ministry, an organized care-giving ministry, the Katharine Guild (a woman’s service group) and a food ministry. We also serve as a meeting space for Alcoholics Anonymous and Alanon. Other opportunities for Christian growth include confirmation instruction, adult information instruction, Vacation Bible School and seasonal evening Bible study. Redeemer congregation was first formed in 1973 by a group of Christians meeting and worshipping at the Green Lake Township Hall. 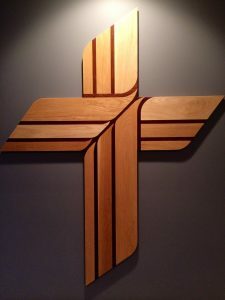 In 1974, the congregation was formally accepted as a member of The Lutheran Church-Missouri Synod. In the early years, the congregation was served by the Rev. James Moehring. The congregation was blessed and grew; and in 1977, the present property was purchased. In 1979, a temporary worship facility was built and dedicated at the present site. In 1981, the congregation called the Rev. Timothy Mowry to serve as its first resident pastor. On July 10, 1988, a new 8500 square foot worship and study facility was dedicated to the building of His Kingdom. Through the years God has blessed us in wonderful ways which have allowed us to grow in blessing to others. We look to the future with confidence in God’s continued blessings. Perhaps you are a gift from God to help us grow in blessing to others. As you look at the rock wall in our sanctuary you begin to notice the individual stones. Some are plain and quite ordinary while others stand out with particular attraction. All of those stones are needed to comprise the whole. With any of the stones missing the wall would be less than it is. A Christian congregation is a lot like that wall. Each individual is a stone, one who plays a unique part in forming the whole. Unlike our stone wall, the construction of our congregation isn’t yet complete. We continue to add stones, moving toward the completeness which God is bringing about. What a joy to see all the new smiling stones dispersed among the older parts of our congregation!